Radishes are some of the cutest vegetables and they are available year-round in vegetable market.Radish's leaf is already cut off before putting on sale, that we throw away what some consider to be the best part of the radish. It’s rich in vitamin and really good to eat with rice. 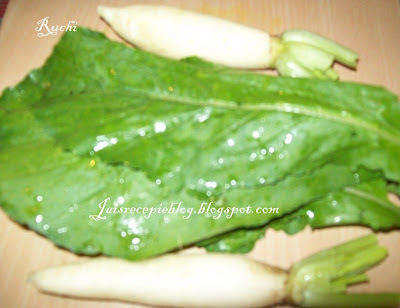 Radish & radish leaves both are rich in minerals and in vitamins A,B,C,D and E. it is really a very healthy recipe. So, recycle your radish leaves. 1.Remove the leaves from the Radish Wash and chop the leaves and keep aside. 2. Grind the Peanuts to a Coarse Powder. 3. Heat oil in a Kadai, add rye and let it splutter. Then add urad dal and wait until it turns golden brown, add chilies. 4.Then add moong dal, add little water and let it cook until almost done. 5. Now add the Radish leaves,Sprinkle little water and Keep until the Radish and the Leaves are Cooked.mix well, add salt and turn off the heat. 6.Now add the Peanut powder and squeeze lime amd mix well thoroughly. Nutritious recipie..Have to try..Thanks for sharing. Healthy recipe jaishree. I will make kootu , dry curry i have not tried. very new to me. looks nice. healthy too. Wow...this is so good.I have heard people using beetroot and carrot leaves but not raddish.Sounds interesting and definetly a great nutricious recipe. I never like radish leaves, but your recipe has inspired me! will try out. Looks so great and healthy recipe. Thats a Healthy recipe... Looks delicious! 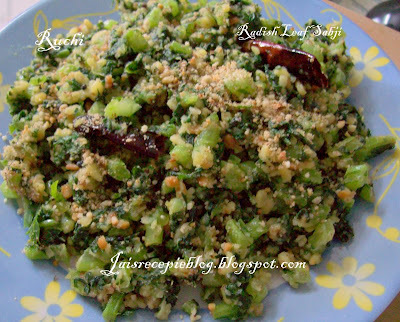 I have never tried making anything with radish leaf - got to try this one. Thx, just what i was looking for. a simple, complete dish.The peanuts are a great touch. Bless u ! !